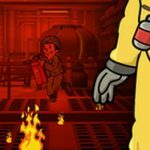 Bethesda recently released Fallout Shelter, a game that one can call a juxtaposition between the styles and themes of the late ‘50s and early ‘60s (back when fallout shelters were briefly in vogue, but ultimately never used) and your typical post-apocalyptic adventure set in the future. It is available right now for iOS, with an Android version confirmed, but yet to be released. 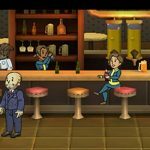 Over the past few days we’ve been giving you Fallout Shelter strategy guides to help you get familiar with the game. 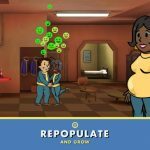 We’ve already shared some general tips and showed you some ways in which you can get more resources in Fallout Shelter, and now we’re going to help you with some tips on how to grow your population and attract more dwellers. Don’t panic if you notice that your dweller count has stopped growing rapidly after the tutorial stage. Notice that all your dwellers are adults at this point; with that in mind, you’ll want to direct one male dweller and one female dweller to the Living Quarters. Once they’re there, they’ll have all the privacy they need. It starts with cheesy pick-up lines, then they dance, and a few minutes later, you’ll see them dancing horizontally out back, with green smileys and Vault Boy giving a thumbs-up – we don’t need to tell you what that means. In short, this is how your dwellers make babies, and that’s one good way in which you can grow your population. We did touch on lunchboxes in the general tips, and one thing you can get out of them is new, and highly-skilled dwellers, though you can also receive Stimpacks, bottle caps, or equipment. They sure beat out the Level 1 babies that are born through the above method, but we must warn you that it’s hard to get lunchboxes without paying real money. Typically, you’ll earn them when you complete some difficult objectives, and if you’ve played seven days straight with a daily report score. Once your population has grown to 20 dwellers, you can access the Radio Studio. This is an important structure as it improves morale and happiness in your post-apocalyptic community, and also increases the odds of someone from the outside knocking on your vault’s door and asking if he/she wants to join your community. It sounds strange, given the risks we warned you about in previous Fallout Shelter strategy guides. 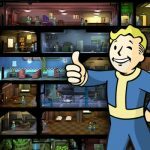 But many claim that if you send dwellers frequently to explore the wasteland, you’ll have better odds of Wastelanders wanting to live in your vault. Still, it might not be as strange as you think; it stands to reason that those Wastelanders found out about your vault through your exploring dwellers. Keeping this in mind, it would seem that high Charisma stats would be of good use in this situation.